Posted on May 31st 2011 at 11:45 pm by Rich. You know I hate “What about my favourite…” type blog comments, but I’ve got to mention “Essential ActionScript 3.0” by Colin Moock, it’s the AS3 bible. Possibly not the easiest book to come to as someone totally new to action script, but everyone I knew in the London agencies waited until it was out before moving over to as3. A dry read, but definitive. Oops, you did mention it in passing, that makes my last comment look stupid. Oh well, I’ll get over it ( Feel free to delete these two to hide my shame, or keep them to laugh at my skim reading ). I got the later two. AS3 Cookbook is a good reference. Peters’ books are excellent all through the line, also the Advanced AS 3.0 Animation one. Another book I can recommend actually is “Advanced ActionScript 3 with Design Patterns” by Joey Lott and Danny Patterson which gives a good overview over most used patterns and also a decent enough insight into events, E4X XML and Regular Expressions. This is a book I often look into for quick help. 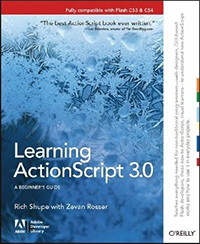 I’d recommend the ActionScript 3.0 Bible by Roger Braunstein. 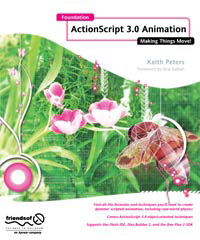 I solely used this book when learning ActionScript 3.0 and found it relatively easy to get what I need from it. It’s probably better for developers who know what they need to do but are unsure of how to achieve it. Whereas for a total newcomer it may be a bit overwhelming. It contains everything most people would ever need, it’s just a matter of finding what you want and piecing it together, that’s part of the fun of programming though. I might need to check out the first one. I’ve had the Essential Actionscript 3.0 and the Cookbook for a couple of years but haven’t done any real Actionscript 3 work in a while.